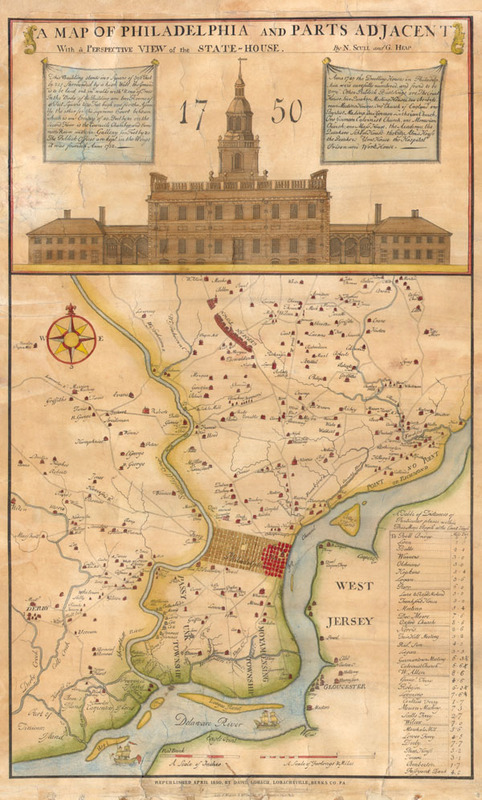 A Map of Philadelphia and Parts Adjacent With a Perspective View of the State-House. This rare map is an 1850 reprint of an important 1752 map originally issued by N. Scull and G. Heap. George Heap, a surveyor and city coroner of Philadelphia, and Nicolas Scull, Surveyor General of the Province of Pennsylvania prepared the original map to illustrate the roads, canals, and important landowers of Philadelphia and its vicinity. This map also features the first known sketch of the Philadelphia State House, which, in 1752 when this map was assembled, was as yet incomplete. We can surmise, therefore, that the sketch of the State House that appears here was in fact drawn from blueprints, to which, as city officials, both Scull and Heap would have had access. The original map was reprinted several times in the upcoming century. It appeared in Gentleman's Magazine in 1753 and in this reprint, issued by David Lobach in 1850. Very Good. General age toning. Backed with linen. Hand color. Wheat & Brun #454-55; Sellers & van Ee #1306-7; M. P. Snyder, Figures 11-16.